No matter how developed or densely populated an area, there is always an opportunity to create a mini oasis within the home. Today's home shows just how it can be done. 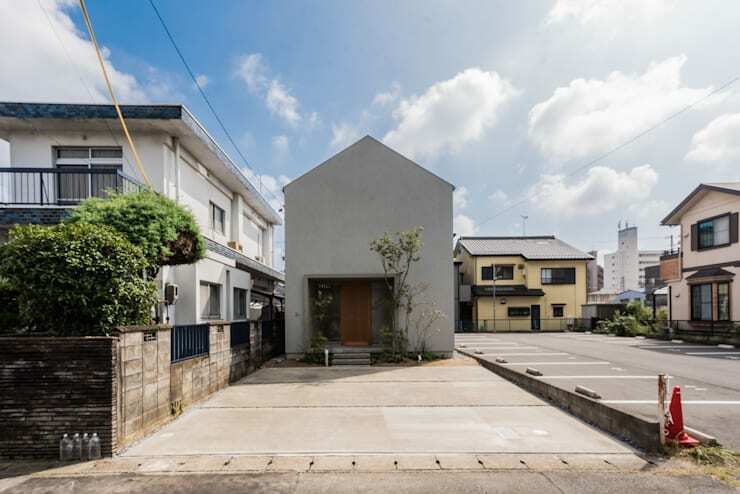 The home is located in the centre of Japan and is bounded on two sides by stark concrete car parks! It hardly seems a promising start for a dwelling, but this is what makes the dwelling so unique. 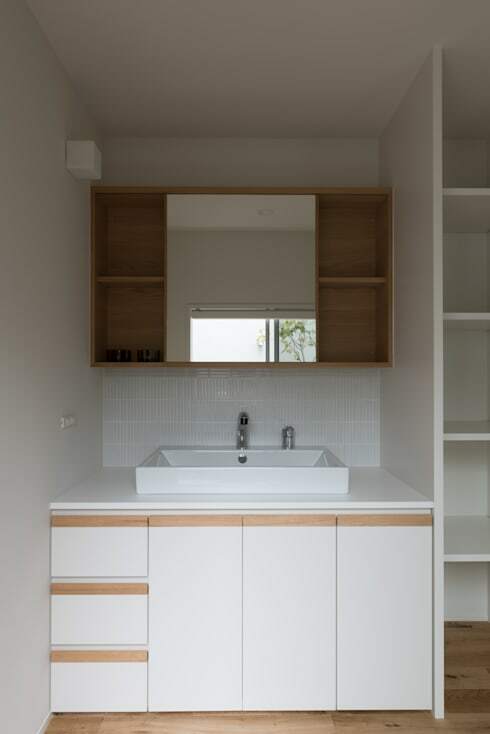 But Japanese architects Reiji Yasue have created a design that covers two levels, has a private courtyard, some very smart window design and more. Let's have a look at it in pictures! The challenges of the location are clear to see. What makes it even more difficult is the fact that it's built on a corner block. Privacy and noise are an obvious issue. To start, the architects designed it with a bare concrete facade and no windows. This provides privacy and even makes it feel harmonious with the environment. The only sign of occupancy is the deeply inset entrance area and the classic peaked roof. 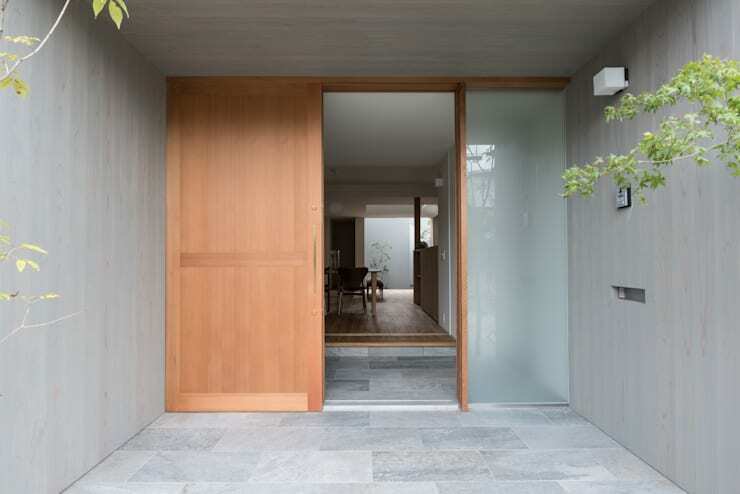 The recessed entrance design also acts as a wind-break and makes it feel a bit like a secret hideaway. At first glance, the interior aesthetic doesn't feel radically different from the exterior. There is a very stripped back decor that seems almost industrial. But it also has a quietly natural ambiance due to the natural grain of the wood floor and the fine trailing branches of the greenery in the garden. In all, it has a very Zen-like peaceful ambiance. All the furnishings are built from wood so the entire space has a very cohesive and understated look. Note how bright it feels despite the lack of windows. 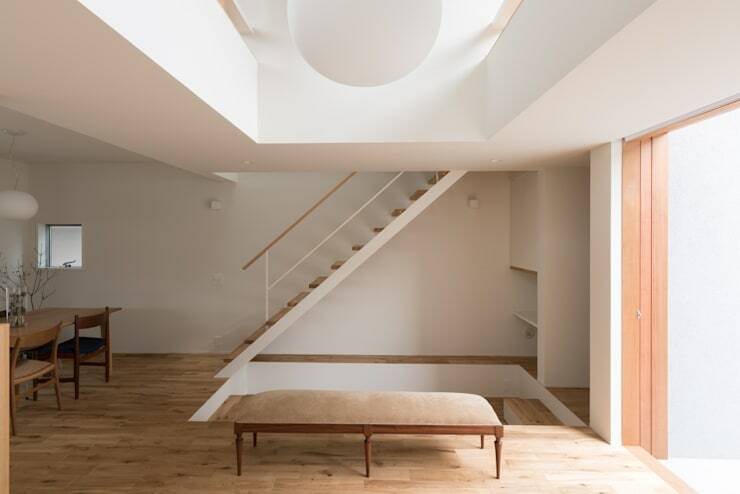 The two levels of the home have been used to create a sort of light well at the centre of the design. This area acts as a high-walled courtyard garden and the profuse natural light flows unimpeded throughout the home. It helps of course that the white walls bounce around all that light. 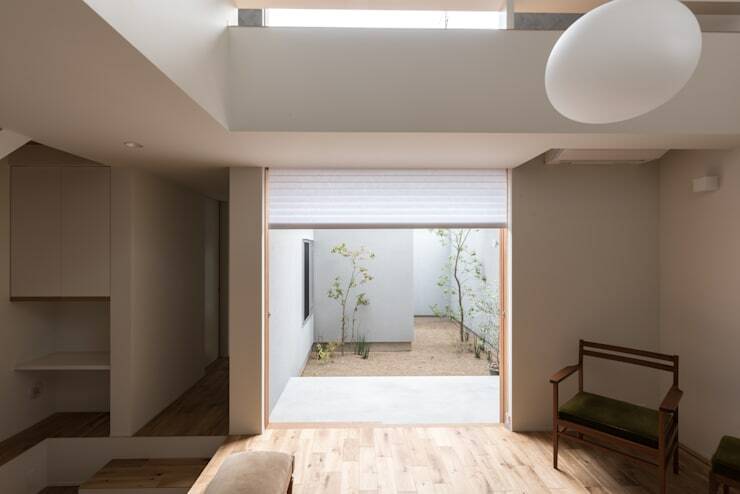 The garden looks somewhat fine and sparse at first, but the very delicacy of the courtyard greenery is an essential theme in minimalist Japanese design. Note the opening in the ceiling of the living room here. A minimalist design like this really brings attention to the quality of the finishes. Here we can see how visually light-weight and fine is the staircase design. The railing has been designed for function, but it also blends delicately into the rest of the room design. Note the sunken living room floor just beyond the settee here. This is another common feature in many modern Japanese homes. One of our favourite areas in the home is the loft. 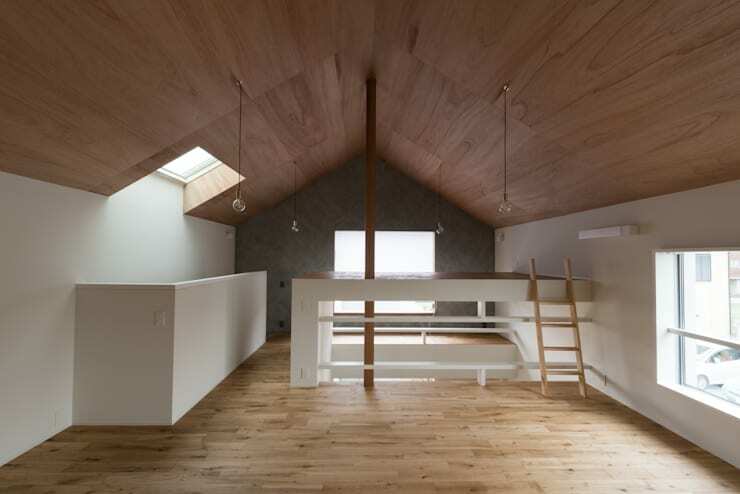 The peaked roof is clad in a lovely timber that really adds to the cosy feel of the room. 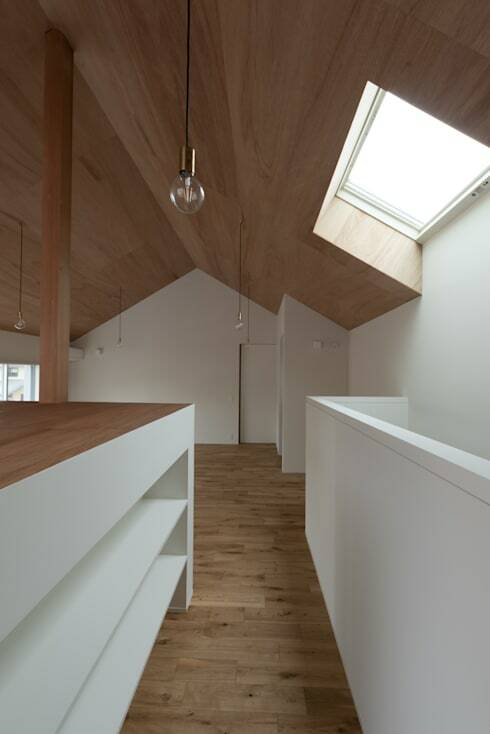 Note how the skylight and side windows are likely to enjoy some privacy too. For special interest, there is also a small ladder leading to a second, smaller wooden platform within this space. 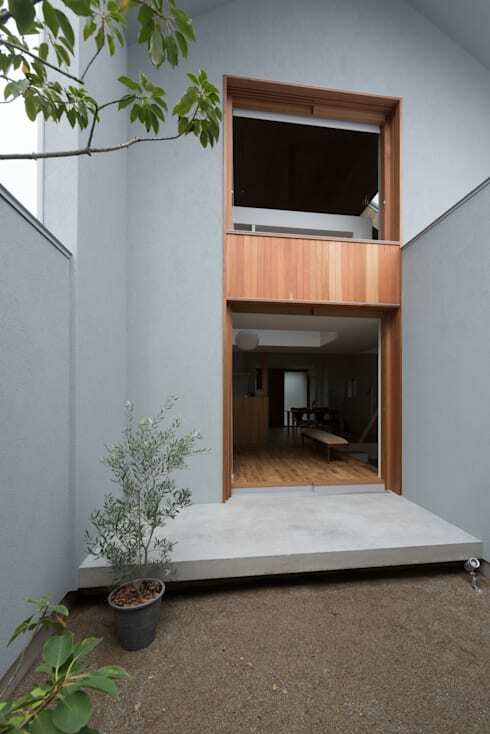 The rear facade as seen from the courtyard garden, gives us a look at the overall design of the home. Here we can see how the high walls and large openings really interact with the outdoor space. The facade is quite simple, but the wooden feature panels add some real warmth to the home. This is just about the perfect urban home for a difficult locale. The bathroom has a custom-built cabinet and vanity that runs from wall to wall and helps avoid those visual breaks that make a small bathroom look cramped. 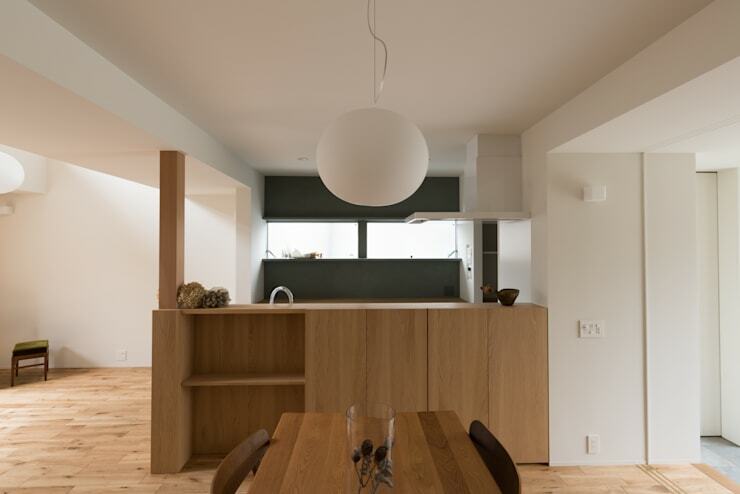 Note how the use of wood also adds some interest and variety to the rather neutral colour scheme. 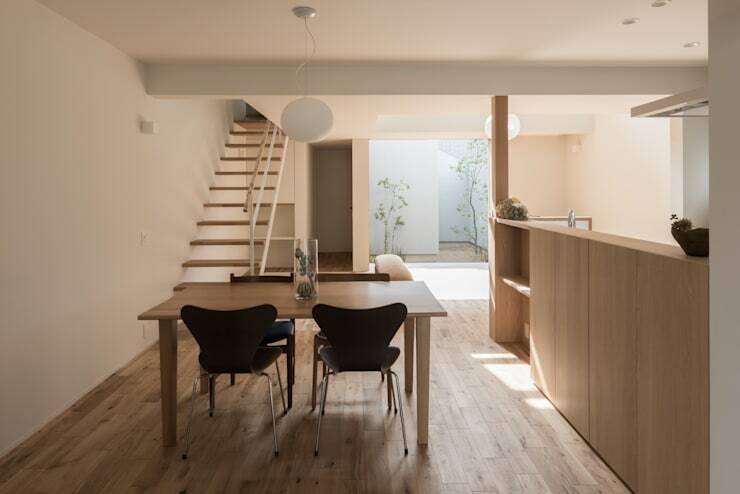 For more architectural inspiration have a look at 9 simple ideas to copy from Japanese home design. What do you think of the private courtyard in this home?